The original Tilt Calculator, on your favorite AppStore since 2012! 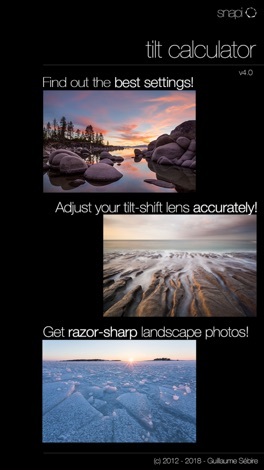 A tilt-shift lens allows to move the plane of focus at will within the boundaries of the lens' settings. 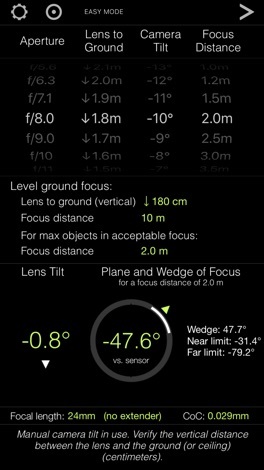 Tilt Calculator determines the best settings of your tilt-shift lens so you can adjust it accurately, and get the focus precisely where you want to! No need to carry printed charts, tables etc. Say also goodbye to blindly fiddling with the lens tilt. Get the app, bring your iPhone, input your settings and you're all set! 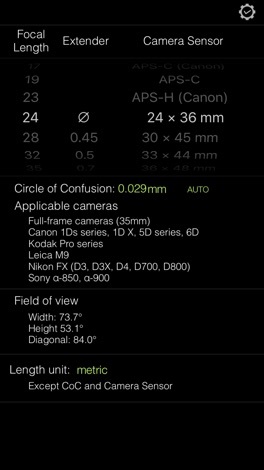 Tilt Calculator not only quickly puts you in control of your lens, it also helps you understand precisely what is happening. The Tilt Calculator app was designed such that it can be used reliably with a single finger. It is a bespoke tool made by a passionate amateur photographer, yours truly, based on actual needs seen in the field by many photographers and me :). It is used by hundreds of photographers around the World. 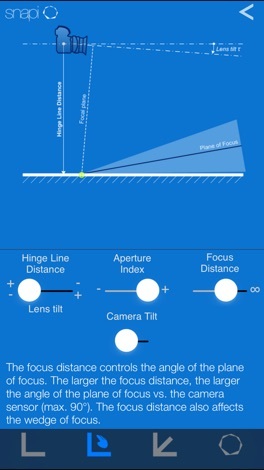 Tilt Calculator contains simple explanations of the plane and wedge of focus, the hinge line etc. and how these change with the lens tilt and the focusing distance, so you know what affects what. On-screen information, Interactive "blueprints" remind and illustrate the basics. Importantly, the app also takes into account your camera tilt, for it is an important part of a photographic composition e.g. in landscape photography. 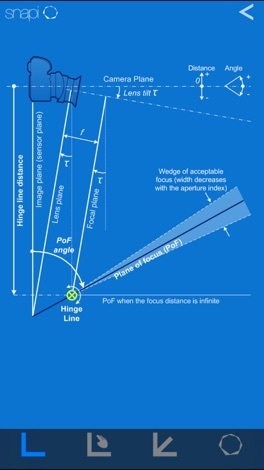 The camera tilt can be set manually or measured automatically. Tilt Calculator comes ready with many adjustable sensor/film formats and focal lengths so it fits with your photographic equipments. 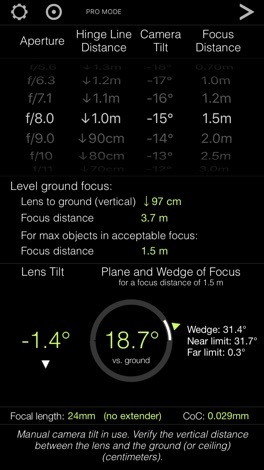 Tilt Calculator also contains a spirit level: accessible from the main screen with a 2-finger tap, the spirit level allows you to accurately adjust the head of your tripod to a level position prior to installing your camera. (Exit the spirit level using a 2-finger tap as well). We fully respect your privacy. We do not collect or share any of your data - the app only stores locally on your device the required settings to operate. Tilt Calculator is an offline app that operates entirely within your device and requires no data connectivity except when sending email feedback (using the in-app form). Any communication will remain strictly confidential. CloneFace+ is a 3D face generator, that requires no special equipment, it just uses one photo to quickly create a 3D model of your face. Since 1690(Genroku, 3rd), Tsujikura, a Japanese long-established shop has created traditional umbrellas. The tradition and culture kept for more than 300 years live on these 34 wallpapers this app provides for iPhone / iPad users. Enjoy their unique textures and colorful patterns printed on the umbrellas made with Japanese papers and bamboo ribs. Use your iPod Touch, iPhone or iPad as a remote control for your BeyondTV Personal Video Recorder system! Requires BeyondTV (not included).